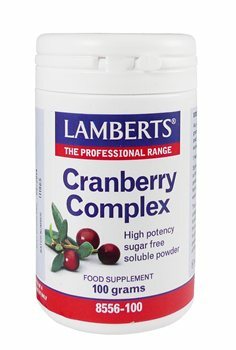 Cranberry Juice Concentrate Powder, Fructo Oligosaccharides & Vitamin C.
This product contains a highly concentrated cranberry powder in a formulation which may help to maintain the health of the urinary system. The fructo oligosaccharides act as a prebiotic, encouraging the growth of friendly bacteria in the gut. Vitamin C - 60mg, Cranberry Powder -c2470mg, Fructo Oligosaccharides - 2470mg. Fructo Oligosaccharides, Cranberry juice Concentrate Powder, Vitamin C.
Take 5 to 10 grams daily, or as directed by a practitioner or pharmacist. (1 heaped teaspoon = 5 grams). Sprinkle the powder into cold water or fruit juice and mix thoroughly. The powder may be taken safely on a long term basis, used intermittently as and when desired. Do not exceed recommended daily dose. Suitable for vegetarians. Smooth transaction, great price, fast delivery.